It was the chance to pursue an engineering degree at India’s prestigious Manipal Institute of Technology that brought Ramit Singal to Manipal, a town ideally located near the world heritage site- The Western Ghats. But in the four years of his stay there, while the engineering degree became part of the formal curriculum, the real education that he cherished and gained was on the array of bird species found in the vicinity. So much so that he published the first- of- its- kind book called ‘A Birder’s Handbook to Manipal’ and inspired many others to join him in his weekly quest to observe the feathered friends. And so, call him an engineer turned naturalist or a passionate bird lover who also happens to be an engineer, Ramit Singal is the quintessential birder and environmentalist who has not culled his love for nature in the grind to earn a ‘better living’ and build a career. India’s Endangered spoke to this youth icon to know more about his interest in wildlife, his book and more. Shared here is the exclusive interview. India’s Endangered (IE) – Tell us a bit about yourself. What are you doing at present? Ramit Singal – Hi. I am currently working with Centre for Wildlife Studies, Bangalore on a project in the Western Ghats. I did my engineering from Manipal Institute of Technology but learnt and worked far more on birds around Manipal instead of my course in the 4 years I was there! IE – What made you take up bird watching? Were you always interested in birds as a kid or is it a passion that developed gradually? 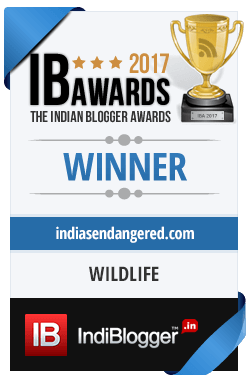 Ramit Singal – I was always interested in wildlife, probably since all our family vacations involved places in the Himalayas or some wildlife-worthy areas elsewhere. I think, with time, the accessibility and ease with which one could watch birds (as opposed to other types of fauna) made me take up bird-watching seriously. Growing up in Delhi, to me one of the best places for bird-watching in the country, and the group Delhibird’s outings helped a lot in ensuring that this wasn’t going to be a hobby I was going to give up easily. IE – You recently published a book A Birder’s Handbook to Manipal. Tell us something about it. Ramit Singal – Well, Manipal is very ideally located on a plateau between the coastal plains and the Western Ghats. And the town, with a constantly growing population of what is majorly college students under the age of 25, is a place where the youth’s talent can be tapped for the betterment of the environment. Unfortunately, awareness about the wealth of faunal and floral diversity is low and even though a sighting of threatened endemic species is always a walk away, no measures are taken for either monitoring or protection of the area. The book aims to map out 206 species as per location and season in accordance with the data collected by me over three and a half years and can be used as a baseline for any monitoring programs for bird diversity and habitats to be carried out later. It is also laid out in such a way that the young amateur birder or visiting birders from outside needn’t waste time looking for sites or suitable birds if time were a factor. Within the pages – the where to find, when to find and how to find has been provided for each species. The results are showing already – with a community of 4-5 birders one and a half years ago having grown to over 100 birders as of today. IE – What are 3 other definitive books on birds you would suggest anyone interested must read. Ramit Singal – Ah! Tough question! My two favourite titles are Glimpses of Indian Birds and Popular Handbook of Indian Birds by Douglas Dewar and Hugh Whistler respectively. These naturalists write wonderfully well with beautiful descriptions that are as poetic as they are scientific. The third is a tougher task. While Rishad Naoroji’s book on raptors is sheer class and a worthy read for anyone, Salim Ali’s field guide is a must for anyone who is new to birding. IE – You are an engineering student. Has the technical knowledge helped you in your love for birds in some way? Ramit Singal – Haha. To be honest, if I were in a course that interested me more, I had probably never take out as much time for birdwatching! As such, engineering has barely helped me directly in anything but for the fact that I still had enough time to devote to birding – something that might have been impossible with, let’s say, the medical fields. But indirectly, there is a lot one can use to apply in the field of bird-watching. Be it data collection, data analysis, softwares for various purposes (I did a course on signal processing and that helped a lot with processing recorded sounds and sonograms) etc. I think every field will help every other field in some way or the other – one must find the right moment and apply the required principles. Every field will help every other field in some way or the other – one must find the right moment and apply the required principles. IE – Is there a rare/endangered bird that you have been lucky enough to see? Ramit Singal – Several, I guess. While I treasure the sightings of most, if not all, birds – some particular sightings do stand out. Off the top of my head, seeing the Broad-tailed Grassbird, Oriental Dwarf Kingfisher, Pale Rock Sparrow, Black Bittern and Pied Hornbills in Manipal were all terribly special. As were the Chestnut-backed Laughingthrush, Snowy-browed Babbler, Green Cochoa and the thousands (literally) of Amur Falcons in the north-east recently. IE – Any funny or interesting incident that took place while you were out looking for birds? Ramiy Singal – There are too many! I guess humour is a must-have when out in the field especially in those duller moments with low activity. I’ve seen ducks in flocks collide with each other which has cracked me up, Spotted Owlets bobbing their heads in response to me bobbing my head towards them, birds missing perches while landing only to slip and land on their bums below – and similar stuff (many things also made up in the bored mind in the form of a story et al) that keeps me entertained. Of course, then there are moments when you slip/fall or watch others do that around you – probably humorous based on how mature (or otherwise) the mind is!